Hello, My name is Andrew Virden; I am the new Director of Census Operations and Engagement. I started in early April and so have not met many of you yet. My job is working to increase awareness of, and participation in, the 2020 Census. I mostly work with the “grass tops” which generally means cities, counties, and elected officials who represent you in St. Paul and Washington D.C. I worked on the 2010 Census doing recruiting and field operations so I have some direct experience on how things work at the Census. This is the first issue of the Communicator, a newsletter from the Minnesota State Demographic Center to folks throughout the state who are engaged in efforts to organize their communities for a fully complete and accurate count in the 2020 Census through Complete Count Committees. We plan to highlight CCC work going on around the state, let people know about upcoming workshops, and help local groups with organization and goal-setting. We'll also share ideas and resources from the Census Bureau, and from local CCCs throughout the state. 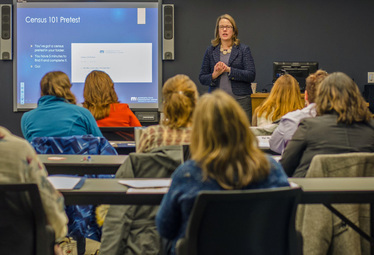 We have completed our first round of meetings around the State of Minnesota and will soon begin working on curriculum for a Round 2 which will have more information about your next steps. Help spread the word by registering your CCC with us so we can best coordinate and encouraging your volunteers to sign up for this newsletter. You can do both of those things using this form. I look forward to working with each of you to get an accurate and fair count for Minnesota! Timeline Update: How far along? By now, you should have begun to identify people who could convene or chair your local complete count committee whether that is at a county or city level. You should give consideration to where the meeting could be held. Please consider issues such as accessibility and parking, which will make it easier for attendees to participate. You should also give consideration to who to invite to be a part of your complete count committee. You want to pay special attention to communities with individuals who are less likely to respond to the Census like students and immigrants. Historically undercounted communities have lower rates of wealth, educational attainment, and English language proficiency. You’ll want to know which areas are considered to be hard-to-count or might have a low response score in your area. Once you’ve done that, you should set a date for your first meeting! You can learn more about complete count committees and contact Andrew directly if you have questions about more information. Let us know where your local organizing efforts are. It'll help us determine where resources are needed. Thanks! In late March, the Commerce Department—agreeing to a Trump administration request—announced plans to reinstate a citizenship question in the 2020 Census. The DOJ also asked the Bureau to release citizenship status data as part of the redistricting files released to the states by April 1 of the year following the census (e.g. 2021) in order to enforce Section 2 of the Voting Rights Act (VRA). At a time of heightened fears in immigrant communities, lawmakers worry that inclusion of the question will discourage participation, altering the accuracy of Census counts. 17 states, Washington D.C. and six cities have sued the administration over adding the question, which they argue will lead to an undercounting of residents, and as a result, harm federal funding in certain areas. More than 160 mayors (including Minneapolis, Minnetonka, and Duluth) issued a letter last month urging for the rejection of the question. The census has not collected citizenship data from every household during the decennial census since 1960 – every decade since enactment of the Voting Rights Act (VRA) – instead collecting the information on a census form sent to a sample of homes. Further, prior to its December 2017 request, DOJ had never asserted a need for block-level citizenship data – which would require a question on the census form sent to every household – to properly enforce Section 2 of the VRA. The ACS, similar to the “long form” before it, asks directly about citizenship status. Currently, the DOJ and civil rights groups successfully enforced and monitored compliance with the VRA after the 2010 Census using ACS data. The question is likely to depress response rates, but it’s hard to say exactly how much. The Census Bureau states their analysis did not provide definitive, empirical support for lower response connected to the question, however the question has not been thoroughly tested and earlier focus groups conducted by the bureau identified fears in immigrant communities. The 2020 Census race and ethnicity questions will follow a two-question format for capturing race and ethnicity for both the 2018 Census Test and the 2020 Census. The Census Bureau will not include a combined question format for collecting Hispanic origin and race, or a separate Middle Eastern or North African category on the census form. As an organizer in your community, you probably have questions: Where do we begin? How do we identify hard-to-reach folks? Where can send people to get their questions answered? At the State Demographic Center, we're building a web site that has resources to get you started, and provide assistance as your local efforts develop. 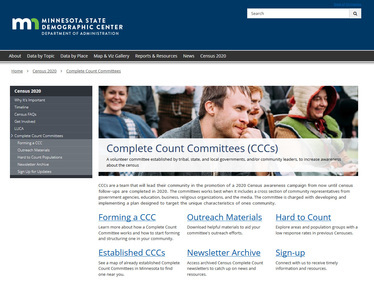 We have information on forming a complete count committee, a link to interactive tools to help you explore areas and population groups with a low response rates in previous Censuses, and outreach materials with useful handouts, graphics and organizing tools that have all the materials used in our CCC workshops. In addition, we're looking for submissions from you. Have an idea to share? A cool graphic or poster? Send them to Andrew so we can share with other organizers throughout Minnesota. State Demographer Susan Brower leads the discussion at a CCC organizing workshop in Fergus Falls on March 8. Fill out our form to register your CCC and/or sign up for this newsletter.